- Deep within the woods, this majestic buck is the undisputed ruler of his realm. 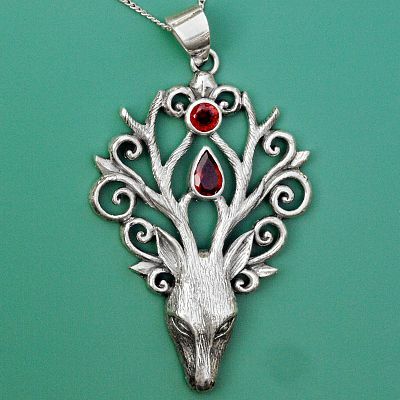 This sterling silver deer head pendant does an amazing job of depicting the King of the Forest, from his wide branching antlers to his regal gaze. 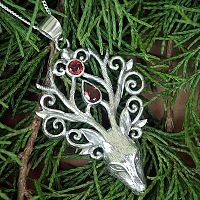 Suspended in his horns are two fiery red garnets, representing his vital life force. This is not a necklace that will appeal to just anyone. This one is meant for those who feel such a strong kinship with Nature that it is simply undeniable. This one is for the wild women and forest lords who will never be tamed. And you know just who you are. 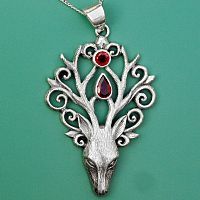 The Silver Stag's Head Pendant measures 2 1/8" tall, including the bail. 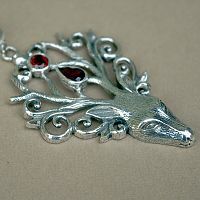 It comes with an 18" sterling chain, and is suitable for both men and women. 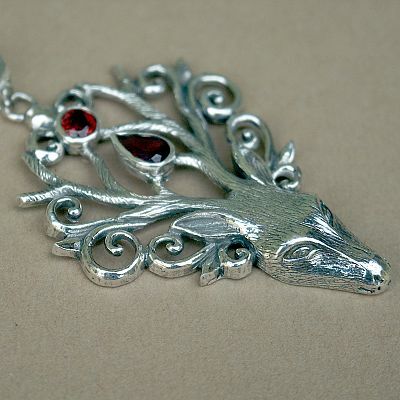 Do you have any other questions about our Silver Stag's Head Pendant?